Rumors in the Teak Lumber market - St Angelo Hardwoods, Inc.St Angelo Hardwoods, Inc. 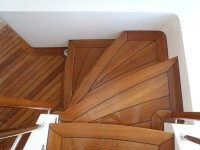 There are plenty of rumors about the teak market. Will supply last? Will there be a ban on logs? Is Myanmar going to ship direct? Will prices be cheaper direct from Myanmar? Is quality going down? Can I import direct? What’s up with this 50% tax I’ve been hearing about? Where will we get teak after the ban is in place? The list goes on and on. I can assure you that no one is absolutely positive of what the Teak Lumber market is going to do. No one from the arm chair know-it-all (we all know a few of these) to the people felling the trees really know. If they did, they would be playing in the stock market rather than the teak market. There is no doubt that you have read many posts and articles about these issues and I’m sure, a few more. First of all, I would like to say that there are only a handful of people in the United States that can answer any of these questions with some sort of confidence that they are being truthful by directly talking to overseas suppliers. All others are merely blowing smoke or regurgitating something they read online. Like this article. We should look at these questions among others, one at a time. Q. Will the teak supply last? A. Well of course it will. Where would it go? The clouds? Supply will always be there. The correct question would be, “Will we have access to the supply?” My theory is if there is a credible demand for teak lumber and decking for either boatbuilding or architectural work, there will be a supply. Many may not agree with the pricing in the future but that will have a direct impact upon the supply. Think about it this way. If you were a teak mill and interest in your product was waning for one reason or another, would you continue to cut stock on a regular schedule knowing it may sit in your yard for a more extended period of time? Of course not. You would concentrate on other items that would bring in a more immediate income. That’s business. This reality is a double edge sword. If the mills are cutting less logs, they have to charge more for their product to have a necessary amount of funds to operate in the black. On the other side, if prices climb, people lose interest in the product and the circle goes round and round. So, back to the original question, Will we have access to the teak supply? In short, yes. Short of being put on the endangered species list (which it is not), supply will continue. Legislative actions have had an adverse effect on supply over the years and it was dealt with by the professionals. Regardless of what people tell you, it’s best to let the professionals handle the import and logistics of procuring teak lumber. If you would like to stay informed about legislative actions or government affairs pertaining to this issue, I would suggest joining IWPA. A wealth of information is available and will help you understand a little better from the governmental stand point. I have read many blogs and heard many stories about customers being told that the supply will dry up soon, we have to raise prices because supply is short, there will be a tax on logs, Myanmar will stop exporting logs in 2014. (The latter two are actually true but we will cover that later) I don’t know if it comes from a misinformed individual or it is [the sky is falling] propaganda to boost sales at this point. As I said, there are some truths to all of these questions but there is also an informed answer. And believe me, not one person, from the mill to the end user knows all of the answers but some are more informed than others. Q. Will there be a ban on logs from Myanmar? A. I don’t even understand this question. It is incomplete. Where will this ban be upheld? What countries are involved? Will it be all logs or just certain grades? Who will actually ban the logs? I would love to hear the answer to that simple question from anyone that can answer it as it stands. Here’s where it all stems from…Myanmar will stop the export of all logs as of April 1st 2014. Deforestation is the main proposed reasoning behind this agenda. There is no doubt that preserving the world’s forest is top priority for anyone in the lumber business. It is how we make a living. Currently, importers like St. Angelo Hardwoods purchase teak through a second country which buys their logs directly from Myanmar. There are several countries on the Asian continent that provide us with this service. A ban on exporting logs to these second countries would make Myanmar the only source for quality teak lumber. There is still some debate over whether forest preservation is the goal or if the Myanmar government will use this as a ploy to sell value added material at a higher cost. So, I guess the answer is still the same. Yes, the supply will still be there. We will need to work on logistics as we have already begun the process. There may be some price fluctuations but I’m sure the supply will last.